Antiquaires since 1970, siret: en 24.430113233 ___________. Large portal key, heart ring, late seventeenth. If you are looking for quality objects: type. Here is a very solid, massive large key, 18cm, 280gr, key gate or heavy door, beautiful ring in inverted heart, turned base, hollow stem, bit question mark, 2 notches and comb 4 teeth: (4 5cm). Time louis xiv, around 1700. 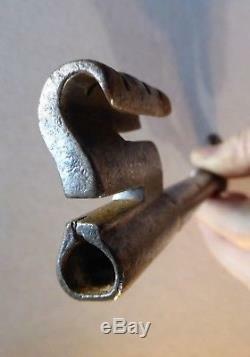 Dimensions = 18cm x 4,5cm. The condition is good, with a lot of service wear, no fault. Our guarantee commits us in the following way: we are not experts, but we refund 100%, without questions and with our excuses, any person disappointed by our sending, in the reasonable time of 15 days. No risk for our customers! The sending of this object 0 for France, and 20 for Europe. Type eclecticnimes on google, hundred of objects. 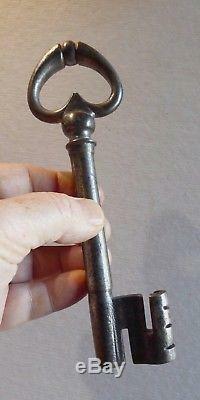 Big gate key, heart ring, late seventeenth. 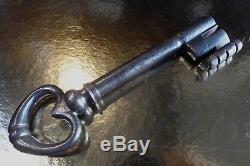 Here is a very solid, massive large key, 18cm, 280gr. Key of gate or heavy door. Beautiful inverted heart ring, turned base, hollow stem, question marks bit, 2 notches and comb 4 teeth: (4 5cm). Louis xiv period, circa 1700. Condition is good, with a lot of service wear, no flaw. The item "big portal key, heart ring, question mark pannel, late seventeenth" is on sale since Friday, December 14, 2018. It is in the category "art, antiquities \ objects of the nineteenth and before". The seller is "dany46" and is located in bellegarde, in camargue.